I’d spent a little time taking photographs of the trees during our recent club show, before volunteering to restyle a club members Juniper. We’d spoken with the members that were at the show to see the best way forward for the tree. i offered a drawing o a drastic style. However it meant splitting the tree and applying raffia o the trunk which we didn’t have in the tools boxes. So I took my time, of course, and designed it with a mental image i’d built up for this tree. Anyone who wanted to ask question could do so, whilst i styled the tree, trying my best to explain to them the processes involved. I didn’t feel any pressure to produce something spectacular, but felt I had to do the tree some justice, seen as it wasn’t mine. There were brittle branches and care was taken to apply the tight bend at the top over the course of the 4hrs styling. Unfortunately I or got the before image!!!!! 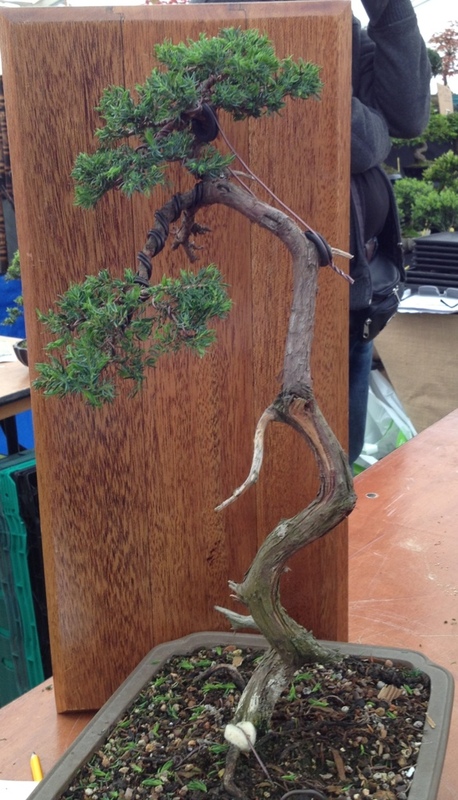 This entry was posted in Shows, VOCBS and tagged Bonsai restyle. Bookmark the permalink.